My husband Jon works pretty long hours and three nights a week he isn’t home until nearly 8pm. This means that I’ll usually cook something for me and the boys and then make something fresh for him when he gets home. 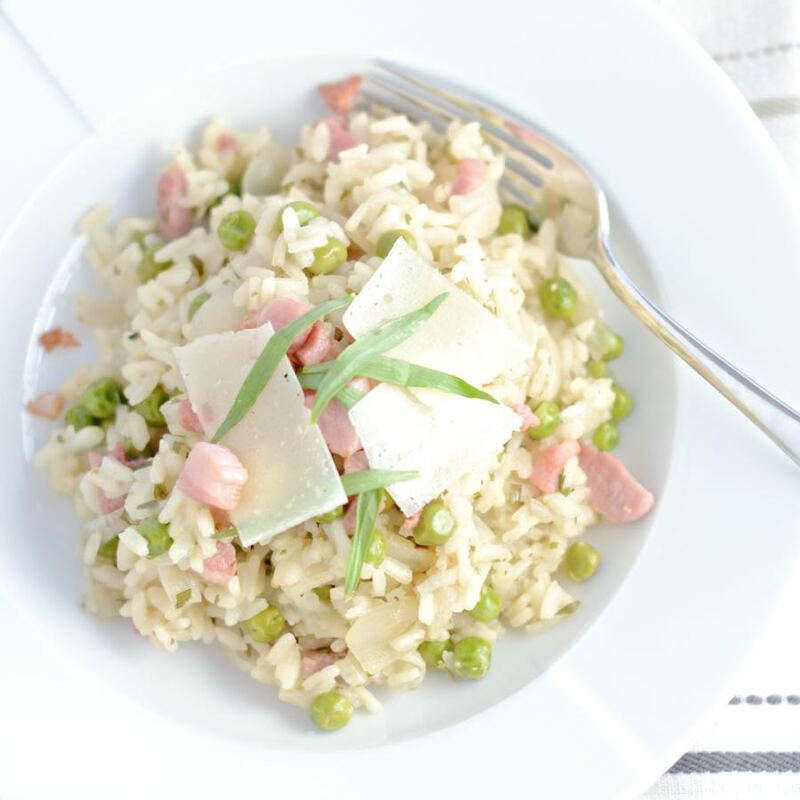 For a while he’s been asking me to make him a risotto and I finally got around to it recently. Given the amount of wine that goes in I wasn’t going to make it for the boys (I know the alcohol gets cooked away but it didn’t really feel right), so I decided to make them one of their favourites and then had a nice grown up risotto for two when Jon was home from work. This originally started life as a vegetarian risotto but Jon was quite insistent that it needed a bit of meat (it’s not often I can tempt him with meat-free dinners). However, you can make a delicious vegetarian version by switching the chicken stock for vegetable stock and leaving out the pancetta. 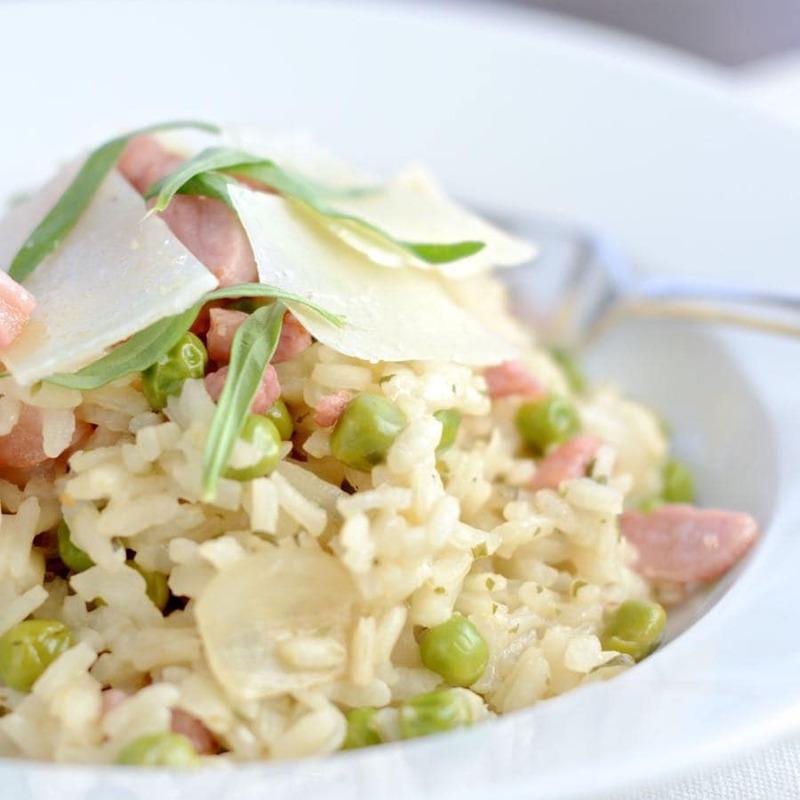 If you want to add a little more body, it tastes lovely with some chopped fennel added to the frying pan at the same time as the arborio rice. Put the white wine (350ml) and stock (750ml) into a large saucepan. Bring to the boil and then reduce down to a simmer. Meanwhile thinly slice the shallots. Heat half of the olive oil (1 tsp) in a large frying pan. Add the pancetta (65g) and cook for a few minutes on a medium heat until cooked through. Remove the pancetta from the pan and set aside to use later. Add the remaining olive oil to the frying pan, turn the heat to low and add the shallots. Cook for three minutes until soft, stirring regularly. Add the rice to the shallots, increase the heat to medium and fry for two minutes. Add 1 ladle of stock to the rice and stir until it has all been absorbed. Once absorbed add another ladle of stock and once again stir until it has been absorbed by the rice. Repeat this process for about 15 minutes, at this point the rice will be almost cooked. Add the frozen peas (100g) and dried tarragon (1 tbsp). Continue adding stock for about another 5 minutes until the rice is just cooked. 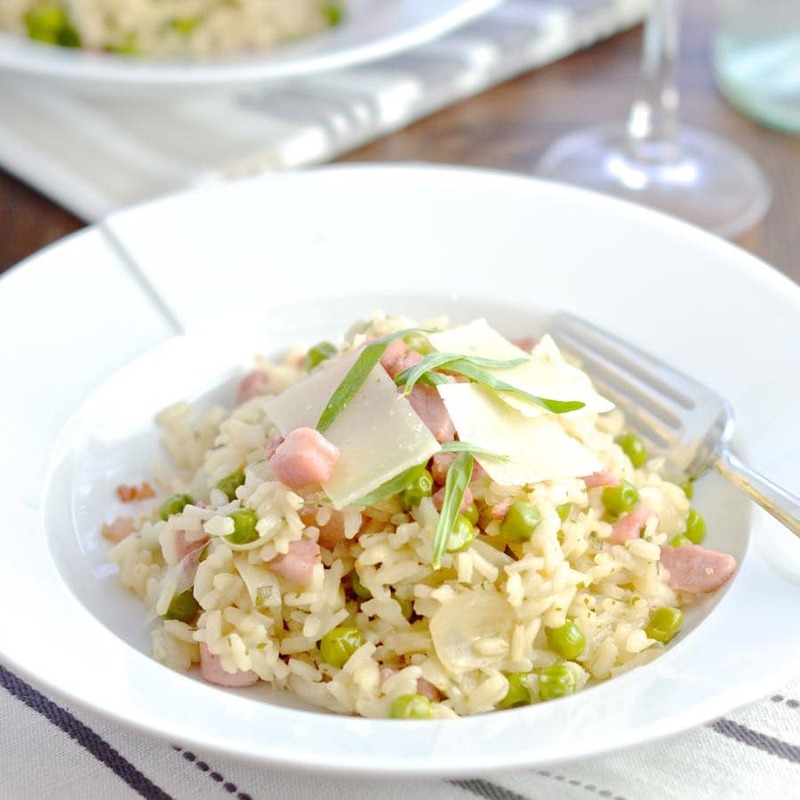 Finely grate the manchego cheese (40g) and once the rice is cooked add the cheese and cooked pancetta and stir to combine. To garnish the risotto I used some manchego cheese shavings and fresh tarragon leaves. For an extra indulgent risotto, serve topped with a poached egg. What flavour did you have?